On Monday morning, I set out early from Spitalfields, crossing the freshly fallen snow in Weavers’ Fields, and walking due East until I came to the premises of Arber & Co Ltd at 459 Roman Rd. Once I rang the bell, Gary Arber appeared from the warren of boxes inside, explaining that he did not have much time because he had to do his accounts. So, without delay, I took the photo above and Gary told to me that his grandfather Walter Francis Arber first opened the shop in 1897, as a printer and stationer that also sold toys. The business was continued by Gary’s father who was also called Walter Francis Arber and it is this name that remains on the stationery today. “I’m here under duress because I’m an airman,” said Gary, explaining that he took over the business, sacrificing his career as a pilot flying Lincoln Bombers when his father died, because his mother relied upon the income of the printing works. “I left the beautiful Air Force forever in 1954,” he revealed wistfully. It is not hard to envisage Gary as a handsome flying ace, he has that charismatically nonchalant professionalism. You can see it in the picture above, Gary retains the Air Force moustache over half a century later, so you only have to imagine a flight suit in place of the overall to complete the picture. There is no doubt Gary saw life before he swapped the flight suit for an overall and vanished into the print shop. He was there at Christmas Island in 1946 to witness one of the first nuclear tests (see it here), though thankfully Gary was not one of those pilots who flew through the dust cloud to collect samples. “We were guests of the day, watching from a boat, we had bits of dark glass and they told us to shut our eyes when the countdown reached two and open our eyes to look through the glass when it reached minus five – but you saw it through your eyelids. Then you felt the shock, the turbulence and the heat. It was great fun.” Mercifully, Gary appears to have suffered no ill-effects, still running the shop today at seventy-eight, driving daily from his home in Romford. These days, Gary’s shop has become something of a magnet for artists who love his old-school letterpress printing but, as a sole operator, Gary now only undertakes these jobs “under pressure.” “The quality is rubbish,” he says, grabbing a pad of taxi receipts and turning one over to reveal the impress of the type, embossed into the paper – the only way he can get a clear print from the worn type now. “It should be smooth, like a baby’s bottom,” he sighs, running a single finger across the reverse of the page before tossing it back onto the pile. I was concerned upon Gary’s behalf until he disarmed me, “I don’t make any money, I’m just pottering about and enjoying myself!” he confided gleefully. Owning his premises, Gary enjoys complete security and the freedom to carry on in his own sweet way. Moving a stack of boxes to one side, Gary uncovered some printing samples for customers to select their preferred options. What a selection! There was a ration card from a butcher round the corner, a dance ticket for December 30th 1939 at Wilmot St School, Bethnal Green, and one for an ATS Social with the helpful text “You will be informed in the event of an air raid,” just in case you get seduced by Glenn Miller and do not hear the siren. There is a crazy humour about these things being here. I turned to confront an advert for a Chopper bicycle portraying a winsome lady with big hair, exhorting me to “Be a trendy shopper.” I turned back to Gary, “This is a shop not a museum,” he said sternly. You could have fooled me. Aware that I was keeping Gary from his chores, I was on the brink of taking my leave, when Gary confessed that he was no longer in the mood for doing accounts. Instead he took me down to the cellar where six printers worked once. “This is where it used to happen,” he announced with bathos, as we descended the wooden staircase into a subterranean space where six oily black beasts of printing presses crouched, artfully camouflaged beneath a morass of waste paper, old boxes and packets with the occasional antique tin toy, left over from stock, to complete the mix. Here was a printing shop from a century ago, an untidy time capsule – where the twentieth century passed through like a furious whirlwind, demanding printing for the Suffragettes and printing for the Government through two World Wars, and whisking Gary away to Christmas Island to witness a nuclear explosion. And this what was what was left. I was completely overawed at the spectacle, as Gary began removing boxes to reveal more of the machines, enthusiastically explaining their different qualities, capabilities and operating systems. He pointed out the two that were used for the Suffragettes’ handbills and I stood in a moment of silent reverence to register the historical significance of these old hulks, a Wharfdale and a Golding Jobber. Gary made a beeline for the Heidelberg, the only one that still works, and began tinkering with the type that he used to print the taxi receipt I saw earlier. This was the heart of it all. I joined him and, standing together in the quiet, we both became absorbed by the magic of the press. Gary was explaining the technical names for the parts of the printer’s pie, when an unexpected wave of emotion overcame me there in this gloomy cellar, on a cold morning in February, up to my ankles in rubbish surrounded by historic printing presses. “Will you print something for me?” I blurted out, and although he claimed he only did this “under pressure,” Gary kindly consented to my heartfelt request at once. 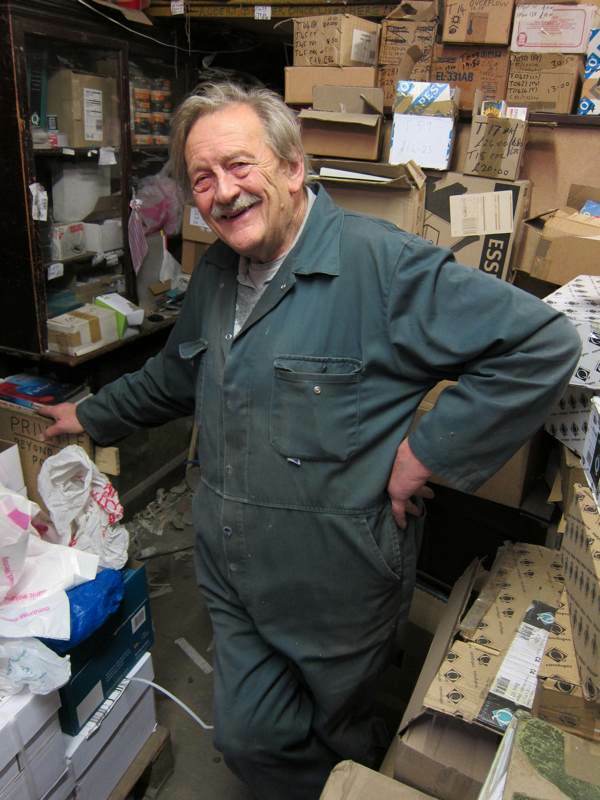 I need some correspondence cards and I am honoured that Gary will print them for me (in Perpetua, my favourite typeface) as a momento of his wonderful printing shop. Once we agreed on the nature of the job, another customer arrived. So I said my goodbyes, secure in the knowledge that I now have reason to go back and continue our conversation, once the proofs are ready. I doubt very much that Gary did his accounts that day, but Gary is a sociable man with a generous spirit (even if he strikes an unconvincingly gruff posture occasionally) and if you choose to pay a visit yourself, then it is highly possible that you will learn (as I did) about the Roman sarcophagus that was discovered in the Roman Rd, or the woman who was the inspiration for the character of Eliza Doolittle in Pygmalion, or Gary’s adventures on steam trains in India, or when Gary was invited to the National Physics Laboratory in the fifties see an early computer, as big as four houses, that could play chess. One word of caution,“Printers are either highly religious or wicked,” says Gary, adding “- and I don’t go to church!” with melodramatic irony. So if you decide to go round, be sure to pay Gary due respect by buying something, even if it is only a modest thing. Bear in mind, as you purchase your box of paperclips, that Gary is there under duress – he would rather be flying Lincoln Bombers – and then, once this subterfuge is achieved, it is appropriate to widen the nature of discourse. 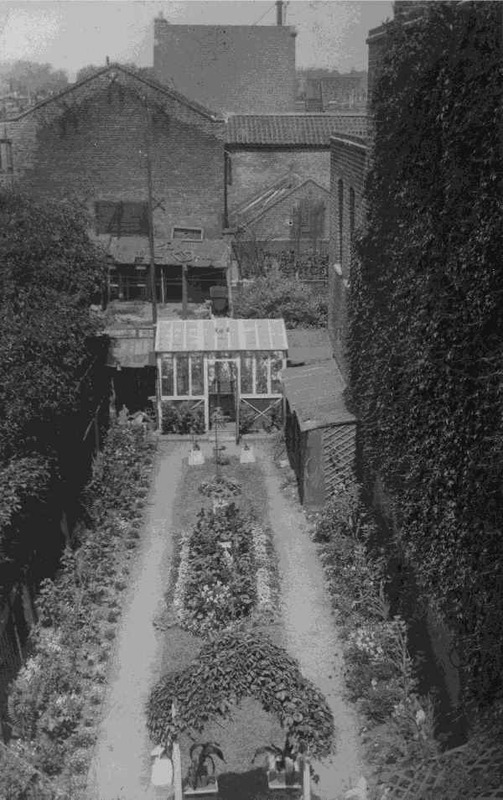 This picture shows the garden at the rear of Arber’s printing works in the Roman Rd photographed in 1930. I was going to photograph the same view today but, once I saw it for myself, I decided that you would rather not know. Great! I can imagine what the garden looks like now. I can’t imagine that Gary has much truck with gardening. Gary (who is a very experienced wildlife photographer and an RSPB Conservation warden) showed me a photo he took of a fox sleeping in his beautiful garden at his Romford home. The truth is a bomb landed in the garden of the printing works during World War II and the site was redeveloped subsequently. This is beautiful writing , so English and timeless. 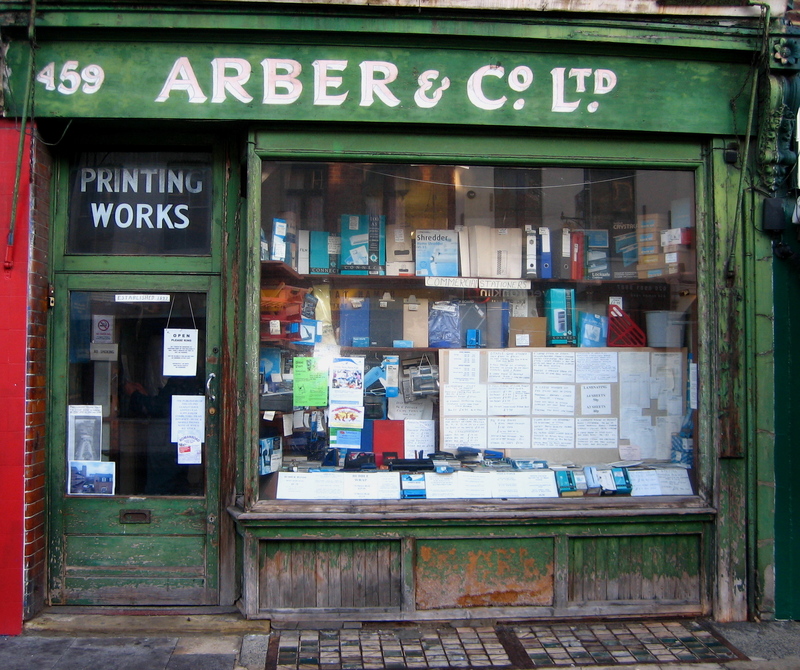 I live round the corner and go to Arber’s every month for our stationery needs. It’s always a pleasure going there. Thank you! I love reading your blog everyday. Keep up the good work. Yesterday I was fortunate to have Gary re live his story of travelling to India as a young boy. 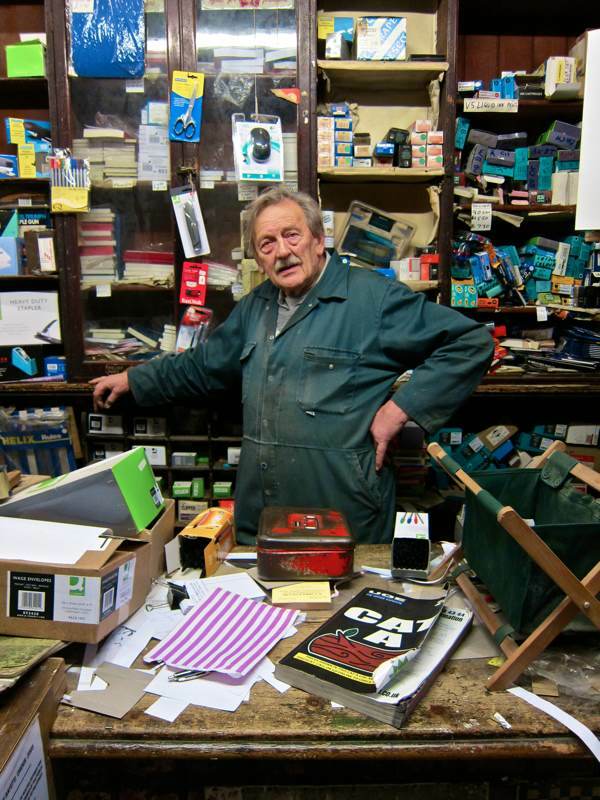 He tells his tales with such vigor and humor and I always leave his little shop of “Mayhem” with a broad smile on my face. Increasing Business rates, Parking Charges and Super Markets haven’t killed off this man. God bless him!!! A lesson to us all!!!! I often think back to the ”Good old Days” when we were all little kids, all 8 of us leaving in Ellesmere Rd, a very sort walk from when Gary as his shop. But then it wasn’t a printing materials he and his wife sold, it was TOYS. I visited my childhood haven recently, and saw the shop again, with all the paper boxes in the big from window, and inside the actual shop where there no rome to move….just like when we were all kids, but then it was beause of the TOYS all laying around. Gary’s hadn’t changed, still has his marbles, we talked for about an hour in the shop door way, as I looked around I could still see all the latast bikes hanging from the ceiling tired with string..the string were still actually up there in the ceiling. We talked about the Christmas club he and his wife ran…Saturdays me my mates and sisters all kids then would just stand in front of the shop big fronted window looking all the TOYS… I could go on and on. Gary to you and your Late Wife.. a BIG thank you for being part of all the the kids in Bow life’s. I grew up in Bow and I remember when I was about 7-8 walking down to the Roman and if I was very lucky being allowed go in to Arbers to look at the latest Matchbox toy cars. Mum & Dad could only afford to buy me a car at Christmas, but I treasured that car so much that I still have a few of them 50 years later! Although I live far away from Bow now, I’m very sad that Arbers is closing, but I wish Gary the best of luck (& thanks for my Matchbox cars). the shop remains. And for you to have witnessed the First Nuclear Tests is historic in itself. who inspired Bernard Shaw for the character of his most famous Miss Eliza Doolittle. Tried to visit when on a trip to the U.K. and London in 2013 but he hadn’t opened that day and thus we (Bob Richardson and I) missed out. Spoke to him on the phone and he didn’t know when he’d be there unfortunately due to ill health.